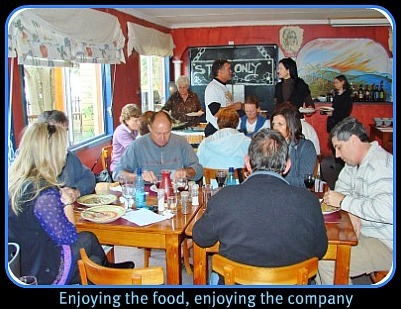 Sedgefield’s first Slow Food Convivium (convivium means banquet or feast) was hosted by La Piazza during the 2011 Slow Festival held over the April Easter weekend. 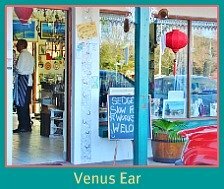 The Convivium is being coordinated by Colin Capon retired international celebrity chef who, in the course of his travels, discovered this secret gem of the Garden Route and decided it was just the kind of place that he and his wife, Auriel were looking for. Now he says, whether he will remain in retirement is fast becoming questionable! 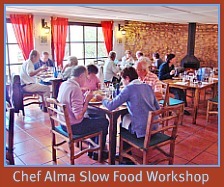 The Slow Food Convivium event began with thirty-five people arriving for the lunch and signing up to become members. 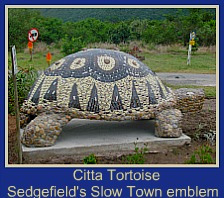 Motivated by Andre Gauche who had instigated the project to gain acceptance for Sedgefield to become Africa’s first Slow Town, an invitation to the general public was extended in our local tabloid, The Edge to attend an inauguration lunch. Colin and Andre were thrilled with the initial response and turnout. 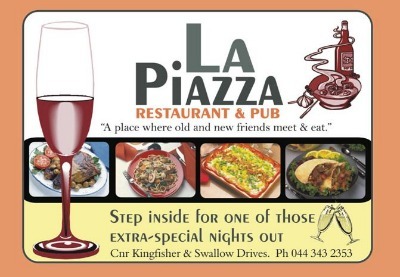 On a cold and rainy, windswept day it was wonderful to be wrapped up warm and cosy in the indoors La Piazza Restaurant. 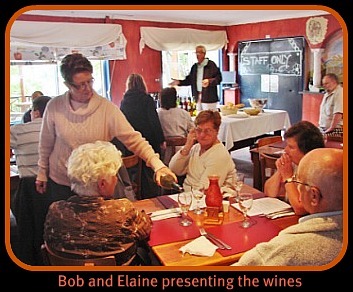 Wine tasting presented by Sedgefielders, Bob and Elaine Dudley opened the Slow Food Convivium. 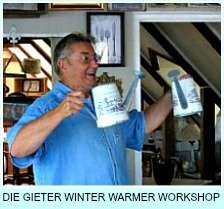 The aim of the wine tasting is to find a white, red and rose wine that could be marketed with specially created Slow Wine labels for Sedgefield. We tasted our way through a number of wines from De Krans (Calitzdorp) - Chardonnay (unwooded, with complex fruity and butterscotch flavours), Chenin Blanc (flavours of honeyed summer fruit with a creamy aftertaste), and Rietvallei (Robertson) – John B Sauvignon Blanc Colombar (blended wine with citrus undertones), John B Cabernet Sauvignon Merlot (subtle strawberry undertones), De Krans Cabernet Sauvignon Rose(cherry aroma –serve well chilled or over crushed ice), John B Riesling (tones of tropical fruit that go well with spicy food like Thai curry), Cabernet Tinta Barocca (slightly peppery after-taste with hints of cinnamon –goes well with stews or bolognaise), De Krans Relishing Red (well rounded with sweetish plummy fruit taste -ideal for braais) and finally the dessert wine Rietvallei Red Muscadel full of raisony sweetness. 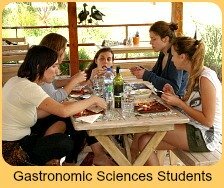 I discovered that it is worth understanding how to pair wine with different kinds of food in order to appreciate both better as correct pairing can enhance the flavour of the food and bring out the best in the wine, instead of, as we so often do, just drinking the same few favourite wines with every meal. 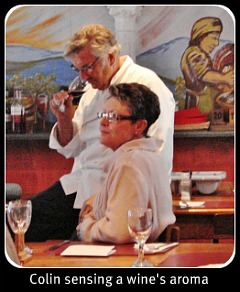 In tune with “SLOW” we took our time savouring the wine and being in the moment. 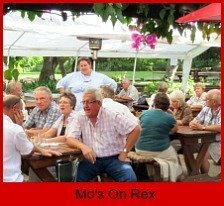 Enthusiastic cooks could participate by bringing along a favourite dish to share or else the entrance fee was R50 – very well worth it I’d say, for the feast that followed. 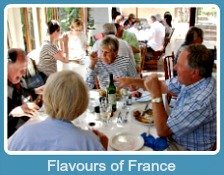 Once the wine tasting was finished we started off the lunch with a scrumptious wholemeal bread with a twist – it’s made with three flours – and a yummy smooth salmon mousse to smear on it. 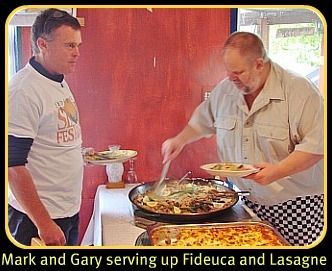 Gary Atkinson of La Piazza then provided a delicious lasagne. Accompanying dishes made by attendees included a Tuscan bean salad, a savoury bread and butter pudding, a crispy broccoli salad, a warm pepper and aubergine bake, a green salad and a lightly curried barley salad – all very tasty! 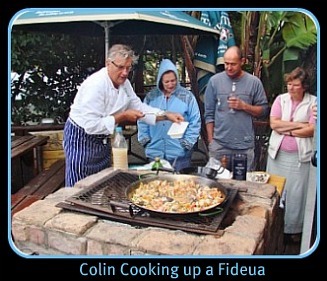 Colin completed the meal with Fideua, a Spanish dish similar to Paella but with a finer sphagetti called Sphagatini that he made on site outside in the inclement weather in a skillet over an open fire, so those who were interested could see how its done. 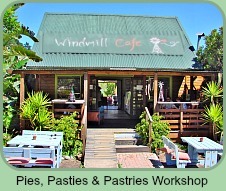 In true Slow food tradition we ate slowly, enjoyed the company and slowly wended our way home sometime after 3pm. 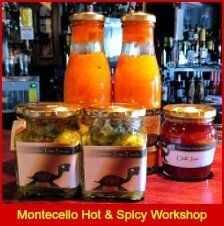 Without hesitation I would say that our first Sedgefield Slow Food Convivium was a great success! Our Johannesburg guests said they thoroughly enjoyed the occasion. Needless to say we didn’t need any dinner! 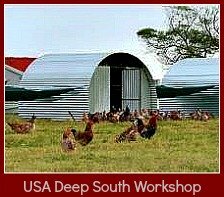 South Africa's premier food directory publishes an illustrated collection of recipes & food articles from experts around the world including traditional, indigenous, Afrikaans and Cape Malay recipes from South Africa for the general public and for publishers and webmasters to use on their web site. 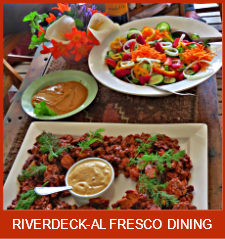 Afri Chef offers easy and Authentic AFRICAN RECIPES for Any Skill Level! In just 10 minutes, you can be cooking authentic cuisine from Africa. With these step-by-step recipes, you will create amazingly delicious African cuisine in no time. So bring the EXCITEMENT AND TASTE of Africa into your home.